As a mom of two kids who get sick ALL the time, I’ve been trying to find natural remedies to help my kids strengthen their immune system. 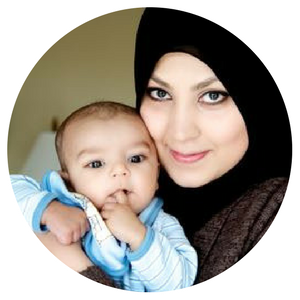 I was so HAPPY when Samia of Sunnah Living offered to write a guest post for me. She’s sharing her remedy for an incredible homemade immune boosting concoction called Elderberry Syrup. Continue reading to find out just how easy and amazing this syrup is and what benefits it contains. While there is nutrition found in everyday fruits and vegetables, there is an entire classification of powerhouse foods that we often neglect: herbs. Many times people fall into the mindset that herbs can only be used for specific things and should be taken cautiously. The reality is very different. Herbs have been used for centuries as everyday food to not only flavor the entrees (hello parsley and cilantro!) but also as preventative measures for illnesses and for treatments. Using select herbs as part of a daily ritual can strengthen our immune system and give our body the tools that it needs to heal itself. Whether it’s cold and flu season, or the change of weather sniffles, people are getting sick in succession. There are times when medical intervention is absolutely necessary. However, you and I can both take steps right now to strengthen our immune system. Doing so will help the body to fight illnesses to prevent any downtime and help it to heal faster when it does using the simple (and delicious) Elderberry Syrup. A plant grown in abundance in the colder climates, elderberries are gorgeous fruits that are only used medicinally. It is important to note that they should not be eaten raw, unlike the delectable blueberries and blackberries in the market. Elderberries naturally contain immune boosting properties and are routinely used to treat the influenza virus. Although you can find quite a few items in your local health food store containing them, elderberry syrup is sinfully easy to make. Add a healthy dose of honey to coat the throat and it provides even more nutrition to the body for a fraction of a cost. Follow the simple recipe below to have the syrup on hand throughout the year. You can use about a teaspoon or tablespoon (if you can’t resist the flavor, like me) a day as a preventative measure. If the virus has struck, however, then take one tablespoon every 2-3 hours until symptoms subside. I love to take it straight in a spoon or my favorite way is to add it over pancakes for a delicious treat. Of course, you can drizzle it on yogurt, in smoothies, or over ice cream for a nutritious treat. Place the berries in the pan, cover with water, and bring to a boil. Reduce heat and let simmer for 30-45 minutes. Smash the berries and strain the mixture through a fine mesh strainer. Wait for it to cool before adding in the honey. Bottle the syrup and store in the refrigerator for 2-3 months. I hope you try this recipe and find it beneficial. If you do, don’t forget to share it with someone who could use this incredible healthy boosting creation. Samia is a beginner plant lady and a holistic non-toxic living advocate from Yuma, Arizona. You can check out her blog at http://www.sunnahliving.com.